Click the "Links" tab in the Event Editor, Task Editor, Note Editor, or Contact Editor. A "Links" tab is found on the Event Editor, Task Editor, Note Editor, and Contact Editor windows. 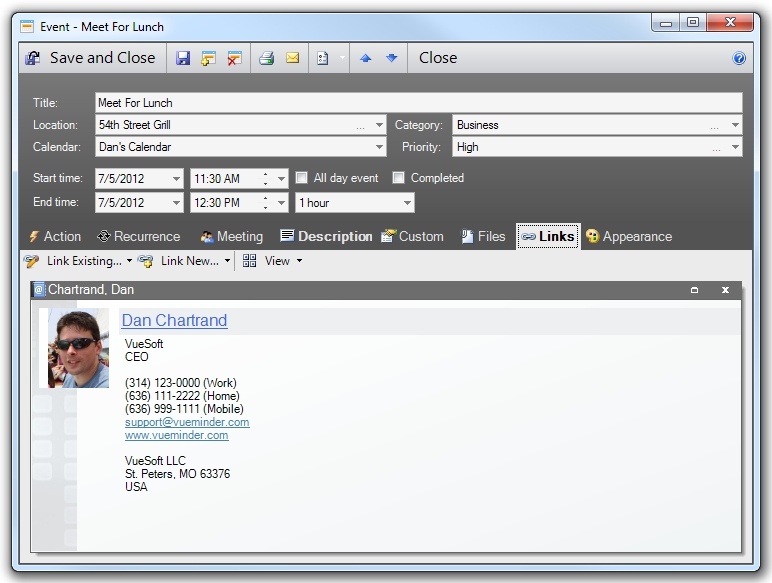 This tab provides the ability to define 2-way links between events, tasks, notes, and contacts. For example, tasks and events could be linked with their assigned contacts, notes could be linked with associated events, or tasks leading up to an event could be linked with the event. When a link is established, it becomes 2-directional, meaning the association between the items can be viewed or removed from either item's editor window, via the "Links" tab. The Links tab presents all associated links in a single view, providing instant access to the details you need, such as an associated contact's phone number and address. Because this feature is so flexible, there are any number of potential uses. For example, you could keep track of all the service calls for client, and see the complete history via the Links tab in the Contact Editor. If you're managing a complex project with a number of associated tasks, you could link these tasks together, and also link each task to the contact(s) that are responsible. The Links tab shows currently defined links and enables the addition of links to other events, tasks, notes, and contacts. Links can also be removed. Each link is shown within a panel when the View option is set to "Tiles". If there are many links, the View option can be set to "List", enabling more links to be seen at one time. To open an associated item, click its name in the Tile view, or double-click its row in the List view. This will open the linked item in a separate editor window. Any changes made to the linked item will be dynamically refreshed in the Links tabs. To link with an existing item, click the appropriate "Link Existing" button at the top of the Links tab and then select the type of item you'd like to link. The Add a Link window will appear with a list very similar to the one shown in the List view. 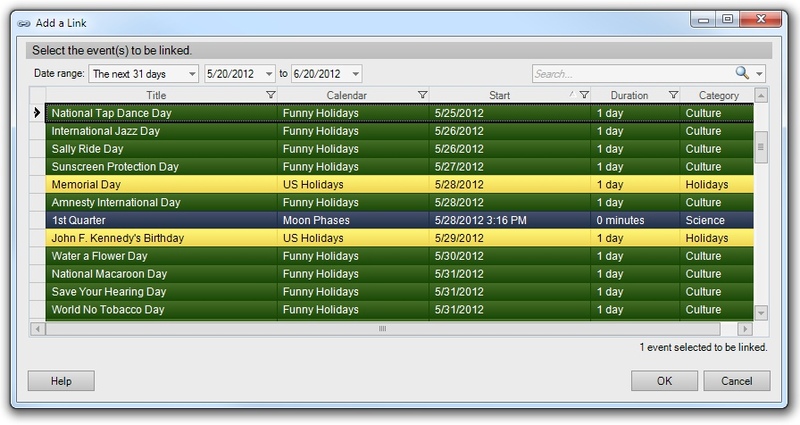 The list can be searched or filtered, and columns can be shown or hidden by right-clicking the column header. To select an item for linking, click its row. Multiple items can be selected by holding the Ctrl or Shift keys while clicking rows. When finished, click the OK button to link to the selected item(s). To link with a new item, click the "Link New" button at the top of the Links tab and then select the type of item you'd like to create. The Event Editor, Task Editor, Note Editor, or Contact Editor will then appear. After saving the new item, it will appear in the Links tab. The link will be bi-directional between the new item and the item that was open in the editor window where "Link New" was commanded. To remove a linked item when viewing items by Tile, simply click the "X" in the upper-right corner of the item's tile. If viewing by List, click the linked item's row to select it, and then press the Delete key or click the red X button at the top of the Links tab. A message will display asking to confirm removal of the link. When the link is removed, it will also be removed from the associated item, since links are bi-directional.